February 22nd will see Philadelphia-based bastions of death metal battery, BASILYSK, self-release their well anticipated new album, ‘Emergence‘. The nine song album is the follow-up to the band’s first studio outing, 2012’s ‘Seasons Of Misanthropy’, but this is not the same BASILYSK that appeared on it. In 2016, the group went through line up changes that now finds the band’s founding guitarist and vocalist Josh Perrin joined by Luke Gary (guitar, backing vocals), Michael Lee Churry (drums), and Jimmy “Grim Jim“ Viola (bass). What this quartet creates upon this album is nothing short of astounding, a materializing of expertly rendered brutality, but such that is honed with progressive qualities. When it comes to death metal in particular, I usually find there are basically two schools of thought at play within the genre. You have the “elementary” classmen, those that keep close to the rudimentary teachings without straying too far away from the basics, and you should know there’s nothing wrong with that, of course. Then, you have those within the “gifted” class, practitioners of what has been taught, yes, but they also possess a desire to push boundaries, to think outside of the box. It is my belief that BASILYSK are the latter, both as a band and as musicians, ones fluent in the normal curriculum. Yet, as such, they are not content just to rehash, recycle, or regurgitate what has come before. No, instead BASILYSK follow their own path, and that is crystalline clear on tracks here like “Molester Of Dreams” and “Fire (In The Temple Of Sacrifice)“. The latter is a pummeling onslaught of chugging riffs and rapid fire drumming with a wicked guitar solo mid-way, and all together they’ll leave you reeling in their wake. Though, to be honest, there are other cuts that find BASILYSK truly pulling out all the stops, so to speak. Two tracks in particular come to mind, a pair of real highlights from the album that happen to be delivered consecutively, and starts with “Sinners Of Their Own Reality“. After a brief sample of what sounds like elevator Muzak leads us in, detonations from the drums are discharged and we are whisked away upon a tempest of aural fury. 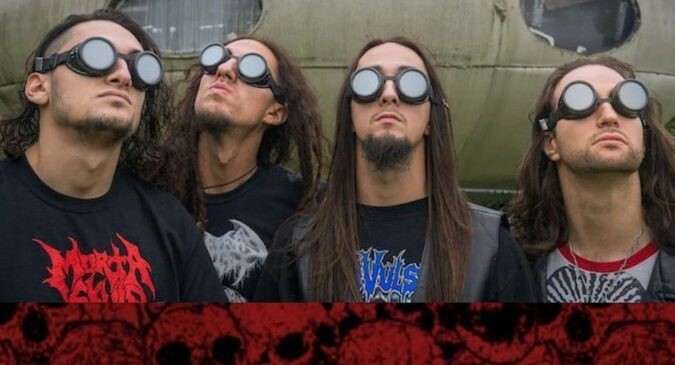 One does not generally think of groove as being something very prevalent in death metal, but you can cast that notion aside for here, it is, just like much of the BASILYSK canon. Before you have time to recover your senses, things are kicked into a higher gear for the breakneck thrasher “Sad State Of The Arts“. Yes, I said “thrasher” because there is no question about this track qualifying, with its quickened tempo creating a fuller feeling intensity, all anchored down to Viola and Churry’s solid rhythmic base. There is also a change-up in the vocal styling as the traditional gutturals are given up for a more straightforward, yet no less harsh or hellish, vocalization. One last point from ‘Emergence‘ that needs addressing is the incredibly ambitious three-part track, or trilogy, “Prebirth – Karma – Afterlife“. Having a somewhat lengthy running time, this is indeed nearly fifteen minutes of BASILYSK‘s finest moments from this album. Pack a lunch and get prepared to be taken to school by this crew for they throw everything they have into this musical maelström of genre-warping wizardry. BASILYSK and its members may be likened unto wizards as well, magical enchanters that work their spells with instruments, not wands. Sonic sorcerers with the knowledge, talent, and means to conjure forth audio alchemy containing fascinating properties rendered with extremity intact. Much like the assumed inspiration for their name – the mythological, serpentine dragon able to slay with but a look, the basilisk – this BASILYSK also kills!